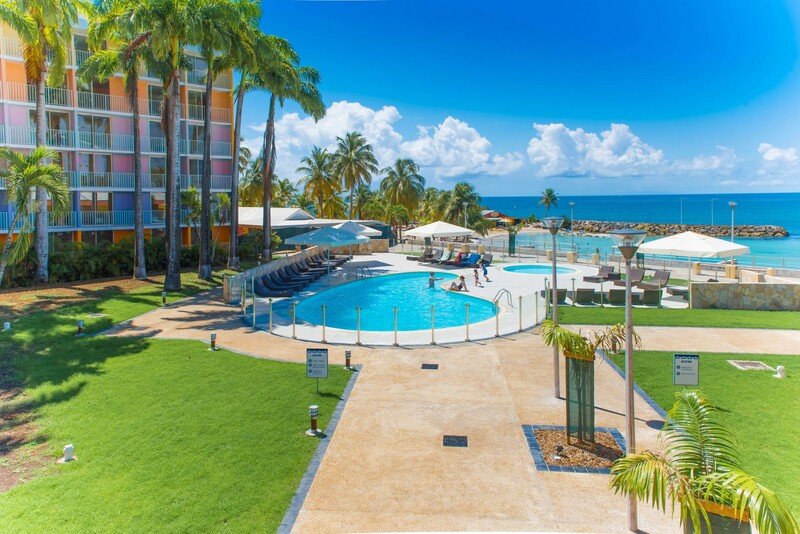 Located on the arc of Lesser Antilles, the Karibea Beach Hotel in Gosier welcomes you in Guadeloupe for a dream holiday in the countries of coconut palms, exotic fruits and other turquoise lagoons. Renovated in 2015 and 2016, our 3-star hotel, consisting of Salako and Clipper hotels and the Le Prao hotel complex, extends over a vast estate bordered by stunning white sandy beaches. Whether you are a family, a couple or friends, on business or on holiday, the idyllic setting of the Karibea Beach Hotel combined with the warm attention of its staff will make your stay on the island butterfly a moment unforgettable. 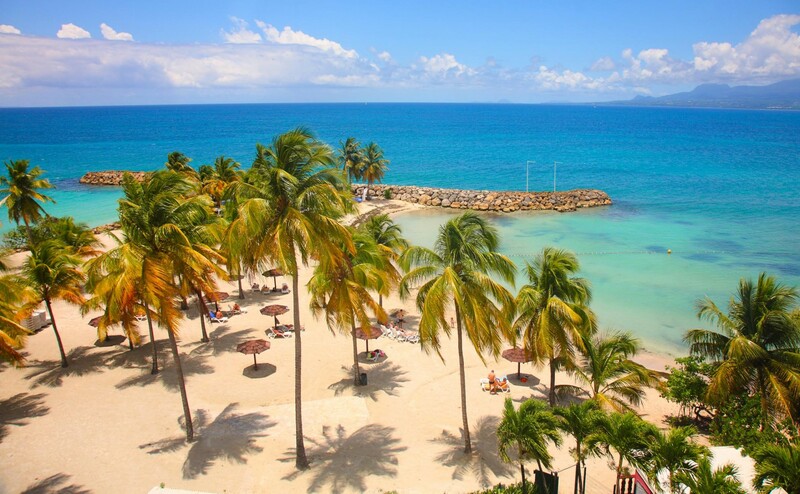 Take advantage of the hotel’s seafront pool the and our beach to relax, from the water sports center to try out new experiences and all our activities for a great stay. To eat, choose between our two restaurants facing the sea: The Saintois and the Pelican. You can enjoy excellent Creole dishes simmered by our best chefs à la carte or buffet. In the morning, have breakfast on our terrace with your feet in the water. Our three establishments are located along the paths dotted with bougainvillea and palm trees that wind through the lush tropical garden of the estate. The bright Standard Clipper rooms have an area of 24m². Decorated with care by blond wood furniture and colorful fabrics, the rooms at our hotel in Le Gosier offer stunning views of the gardens from the balcony. Each room is air conditioned and equipped with a shower room, a safe, a refrigerator, a telephone and also has free wifi access and a satellite television. Wake up in one of our bright Standard Clipper rooms with sea view of 24m² and enjoy from your balcony a breathtaking view of the sea with, in the distance, the Soufrière volcano, a real symbol of Guadeloupe. Carefully decorated with blond wood furniture and colorful fabrics, each room is air-conditioned and equipped with a shower room, a safe, a fridge and a telephone. Free wifi access and a television with satellite channels. Renovated partially in 2016, Salako superior rooms offer a colonial style, 116 rooms of 28m², welcoming and comfortable, all with a balcony and a magnificent view of the gardens. Each room is air conditioned and equipped with a shower room, all renovated in 2016, a safe, a refrigerator, a telephone, a flat-screen TV and satellite channels and a free wifi access. Salako superior rooms with sea view offers in a colonial style its rooms of 28m ², bright and comfortable, all with a balcony offering a magnificent view of the turquoise blue of the Caribbean Sea against the backdrop of the charming Ilet Gosier or Basse-Terre the majestic volcano Soufriere, symbol of Guadeloupe. Each room is air conditioned and equipped with a shower room, all renovated in 2016, a safe, a refrigerator, a telephone, a flat-screen TV and satellite channels and a free wifi access. In an exotic and warm decor, the apartments Prao welcome you for a holiday in complete freedom and offers all the necessary comfort for a holiday with family or friends. The 45m² Prao apartments have a terrace with an equipped kitchenette overlooking the gardens. All apartments are air-conditioned and equipped with a safe, free Wi-Fi access, satellite TV and a telephone. They have a separate bedroom with en suite shower room, a living room with a sofa bed and an additional shower room. Discover our best promotional offers. Book early at the best price, 20% off ! For your comfort, at the Karibea Beach Resort Gosier, the Internet access in WIFI is free and unlimited on the whole site. As for dining, sample the generosity of Creole cuisine with our Saintois buffet. 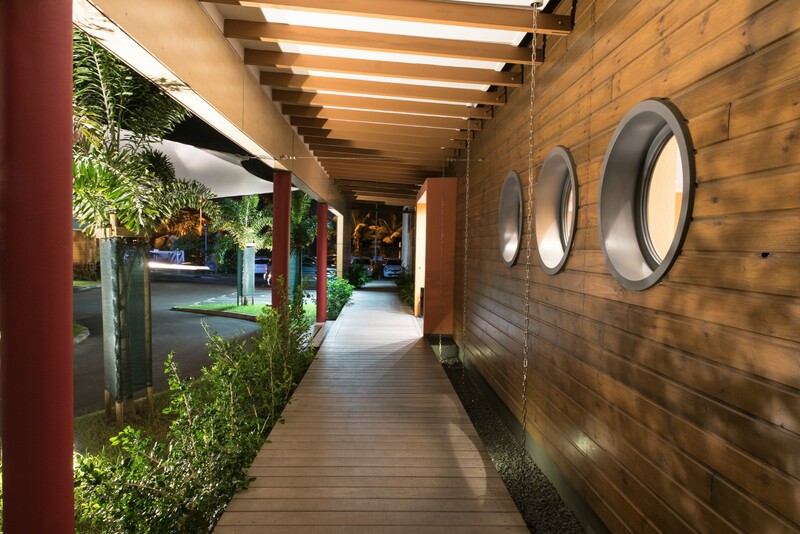 Completely renovated, the restaurant receives you with happiness in front of the sea and in the sweetness of the trade winds of Gosier. Treat yourself to a pleasant start to the day by having breakfast, outside on the terrace or indoors in the air-conditioned room, served as a full buffet from 6.30 am to 10 am. For your lunch and dinner, according to your tastes and desires, you will enjoy traditional cuisine where acras (cod donuts) and colombo sauce rival perfumes. For a la carte restaurant, the Pelican restaurant welcomes you with happiness in front of the sea and in the sweet trade winds of Gosier. 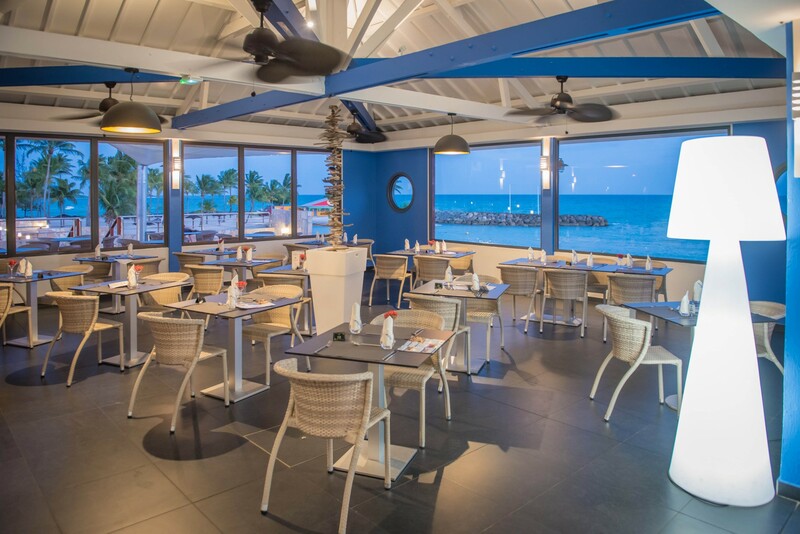 Freshly renovated and enlarged, directly on the beautiful beach with turquoise waters, enjoy this pleasant restaurant open for lunch and dinner. Throughout the day, you can also enjoy a drink while admiring the view. In the evening, the bar Le Gommier offers tasty cocktails to the sound of local music, catchy and swaying. Open from 17:00 to 23:00, Le Gommier is located in the entertainment hall. For your relaxing afternoons, a beautiful swimming pool as well as a paddling pool for the little ones and a new comfortable and cozy lounge area are available for relaxing moments. For your comfort, we have thought of everything: ready towels Beach, sunbeds and umbrellas are at your disposal. Devices have also been installed along the beach to allow you to play beach volleyball. You can also enjoy the petanque area, table tennis and two tennis courts. For your evenings, we offer a rich and entertaining entertainment program that varies with the seasons. For example, you can relax by listening to a folklore group, or entertain yourself with karaoke evenings, games and other dancing evenings. Once a week and in season, a small market takes place in the resort to let you discover local crafts. Because children also have the right to have their holidays, we have reserved their spaces and activities for them. Take advantage of it to take time for yourself, our teams will take care of your children by proposing sports and aquatic activities, cultural and artistic workshops and games. Child from 5 to 11 years. Schedule from 8:30 am to 5 pm, open during the school holidays every day except Saturday, Sunday and public holidays. The presentation of the up-to-date vaccination record is compulsory. Pre-registration at the resort reception. Price: free with no meal or 20 € per child per day for lunch and snack. Very quickly accessible by foot or by car, a multitude of activities adapted to the desires of each one is also proposed to you: lazing on the most beautiful beaches of the island (Datcha Beach, Sainte Anne, Anse Tabarin), water sports, excursion On the unspoiled islet of Gosier to meet the iguanas and pelicans Gran Gouzier, visit the Saint-John Perse museum and the Parc des Mamelles zoo, hiking, coconut water tasting in the splendid landscaped park of Calvaire, discovery The Cascade aux Ecrevisses, shopping or even dine in one of the many restaurants of Gosier ... the choice belongs to you! 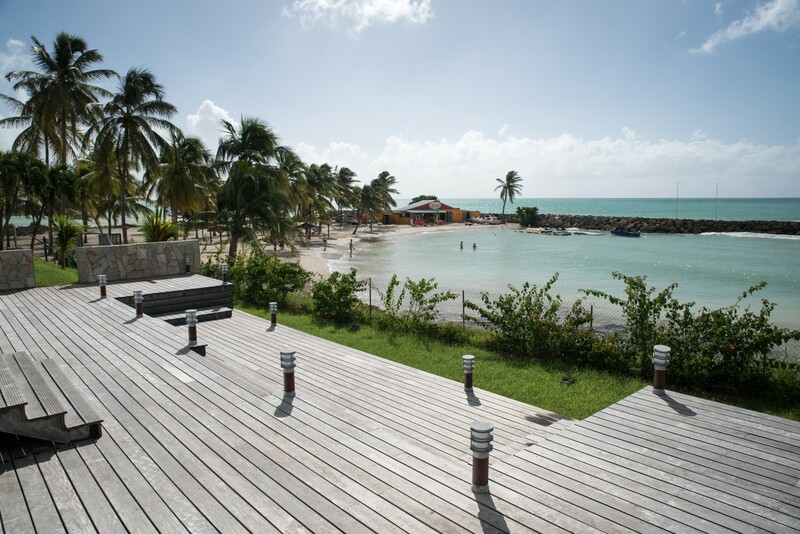 The resort is 12 km from the Pole Caraïbes International airport that serves French companies, but also American Airlines, Air Canada and the regional companies in Martinique, St Martin and the English and Spanish-speaking islands. 5 km from the marina for pleasure boats and 10 km from the ferry terminal where the boats arrive from Dominica, Martinique, Marie-Galante, Les Saintes, and all the neighboring islands. From Pointe-à-Pitre or from the airport, take the direction Pointe-à-Pitre, then GOSIER / SAINTE ANNE, then Gosier Center on the right. After taking the ramp on the right in the direction of Gosier Center, go straight on, pass two roundabouts, then take the 2nd ramp on the right "Pointe de la Verdure" Route des Hôtels and Casino. The KARIBEA BEACH RESORT is on the left after the Casino. For your professional or private events in Guadeloupe (business seminars, conventions, receptions, wedding ceremonies, ...), the Karibea Beach Hotel in Gosier offers 400 m² of fully equipped air-conditioned rooms, Development and consulting. Available, our team adapts to your needs to respond to each of your requests. If you would like to stay up to date with news, promotions and other special offers, subscribe to our newsletter.